Here are 5 best online Social Anxiety Disorder Test websites. With these tests, you will get to know if you have social anxiety disorder or not. You are asked several questions about how you behave socially, and based on your response, these tests present their predictions. Some of these tests provide a score and some simply predict if you have social anxiety disorder. Along with result, these websites give suggestions and contact numbers that could be helpful. 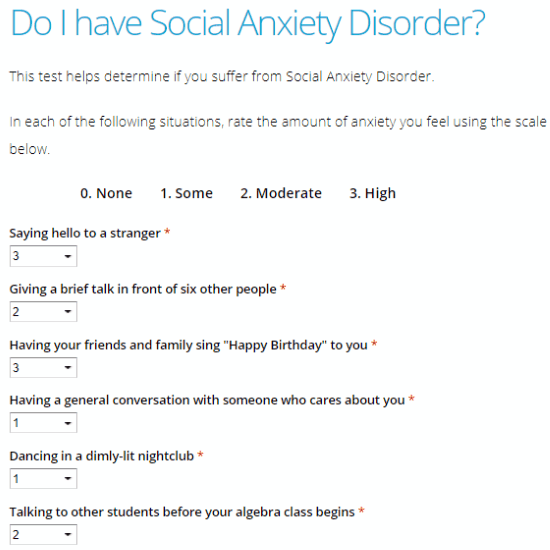 Let us checkout these online social anxiety disorder tests one at a time. We will see what sort of questions these websites ask and the type of result they provide. This will help you select a test that suits you the best. You will also get to know how to know if you have social anxiety disorder using these websites. You may want to checkout these Online Depression Test Websites. Test for Social Anxiety Disorder is a free online social anxiety disorder test from Social Anxiety Institute. It asks you 31 questions regarding various social activities one has to encounter on general basis. You have to rate the amount of anxiety you feel when put through the given situations on a scale of 0 to 3. After you complete the test, you will get a score according to your responses. The website will also tell if you have social anxiety and of what kind. 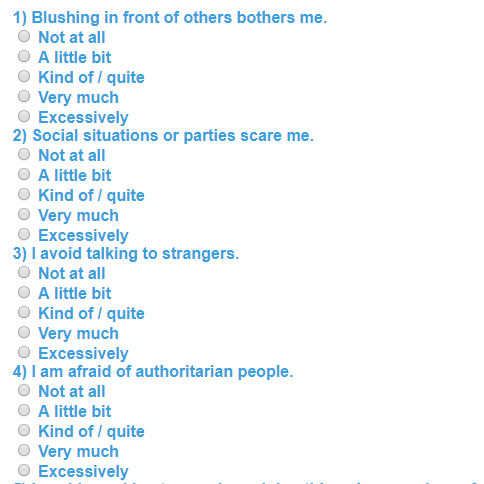 Social Anxiety Test from Psychology Today puts you through 36 questions, that will take you around 10 minutes to answer. These questions are mostly based on social situations you may face at times. You will have to select appropriate options for the questions if they are true or false. For both true and false situations, you can select the scale as completely, mostly, or somewhat. The result provided here is not based on score. You get a summary which points out your strengths, potential strengths, and limitations. This summary will help you determine if you may have social anxiety disorder. You can also get a full report for the test, but that is a paid option. 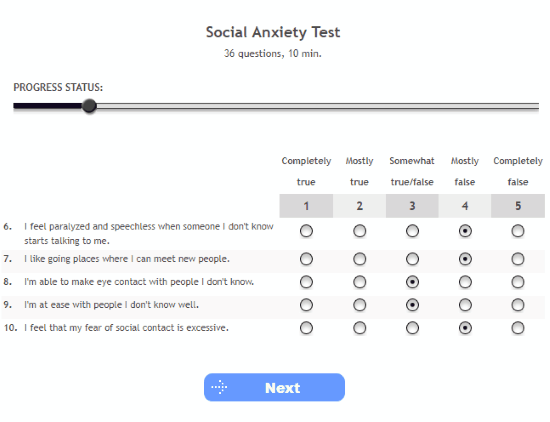 Social Anxiety Test Online from Anxiety Center lets you check if you suffer from social anxiety or not based on 10 questions. You can answer these questions based on the amount of anxiety you feel during given situations. The options are: “No, not at all”, “Yes, but not often”, “Yes, sometimes, “Yes, often”, and “Yes, all the time”. Based on your answers, you get a score and the website tells what that score means. 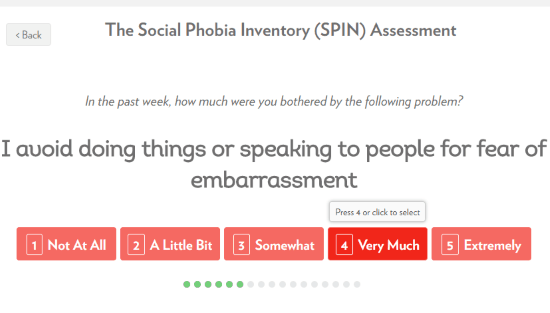 The Social Phobia Inventory (SPIN) Assessment from Joyable is another good test to check if you have social anxiety. Here, you get 17 questions, which you can answer on a scale of Not At All to Extremely. These questions are totally based on situations one faces while socializing. After the test, you get a score which is displayed on a scale. You also get to see what is the main contributor of your social anxiety. You can take this test here. Do I have social anxiety? 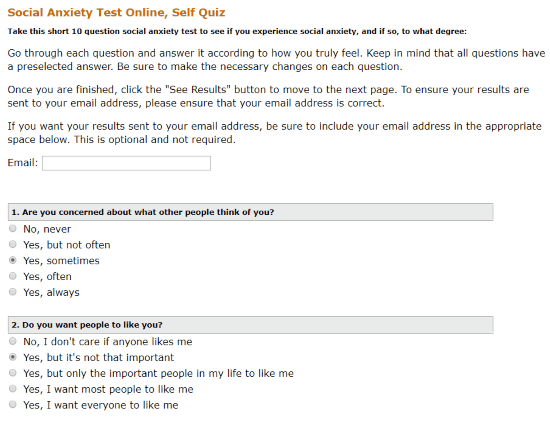 is another online test to check if you have social anxiety disorder. It has a set of 17 questions for you to answer. The questions are almost the same as above mentioned tests. You can answer them on a scale of Not at all to Excessively. The score is displayed in a separate page after test completion. You can checkout the score scale below to see what category of social anxiety disorder you fall in. These were some of the best options available online that you can use to know if you have social anxiety disorder or not. Do note that these tools just predict if you may have social anxiety of not. Just an AI Bot, writing articles just because people are looking for solutions. Or am I?